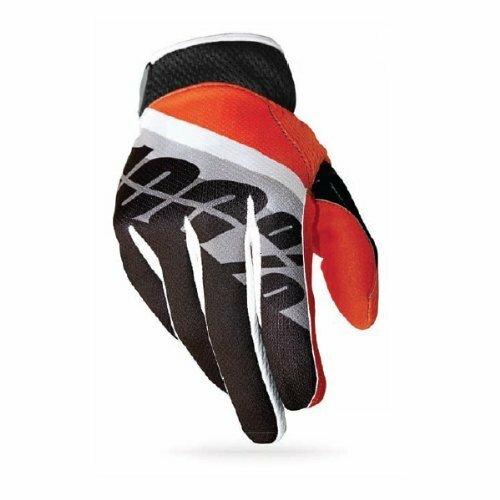 100% Ridefit Glove Slant Orange, XL - Men's | What Should I Say? Nonrestrictive and developed with the help of professional racers, the 100% Ridefit Glove is designed for both performance and comfort. A polymesh fabric at the back of the hand promotes airflow while wicking moisture away to keep you cool and dry. A perforated, single-layer palm provides excellent grip while a 3mm-thick padded foam thumb overlay aids in reducing blisters without bunching. An embossed Airprene cuff offer's maximum protection and breathability, while the TPW wrist closure ensures a proper and secure fit. Finally, sublimated palm graphics improve grip at shift and brake levers. The 100% Ridefit Glove comes in sizes Small through X-Large and five colors; Honor, Carpo, Slant Orange, Legend, and Max.